Traditional Chinese Yixing teapots are ideal for green teas. Yixing (pronounced ee-shing) teapots first appeared during the Sung Dynasty (960-1279) in a region of China, located in the Jiangsu province. The Jiangsu province is the world's only source for the unique clay from which Yixing teapots are made, called purple or red clay.PURPLE CLAY (ZISHA) is also known as 5 colored clay because its basic colors are, red, yellow, green, blue and purple. Purple clay's unique properties make it ideal for brewing tea. The porous nature of purple clay absorbs the flavor, smell, and color of the tea that is brewed in it. Over time, Yixing teapots develop a seasoning from repeated use, making the tea brewed from a well used teapot a special treat. For this reason, most people will dedicate a single flavor of tea to a specific Yixing teapot. This set of 2 cups and saucers go well with the Ideal and Wind teapots. 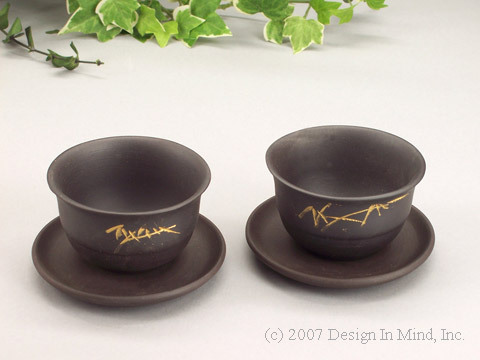 Brown-black with gold bamboo design hand etched on the front of each cup. Cup 3"d x 1.75"h. Saucer 3.5"d.
This set of 2 cups and saucers go well with the Prosperity and Song teapots. 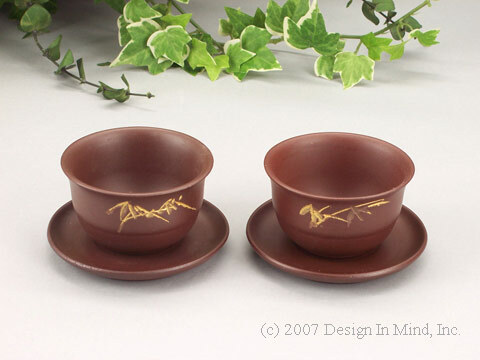 Brown with gold bamboo design hand etched on the front of each cup. 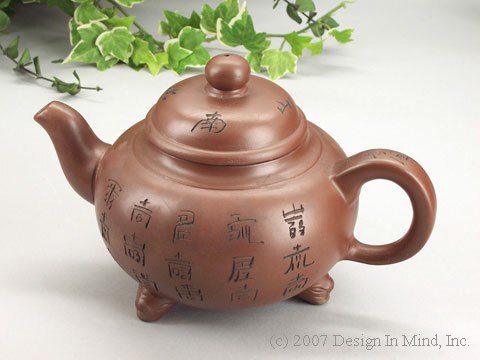 Cup 3"d x 1.75"h. Saucer 3.5"d.
This Yixing teapot is milk chocolate brown color with chinese characters etched into the sides and has an internal strainer. A nice sized teapot measuring 8"w x 5.25"h x 5.25"d. Sits on three legs. Holds 18 oz. 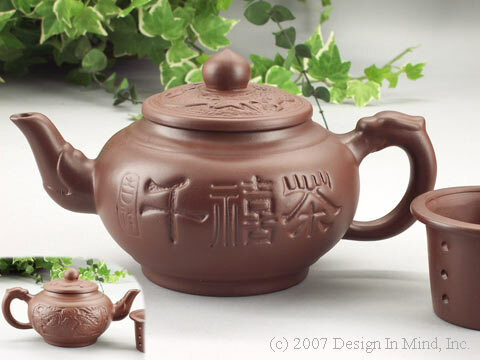 This wonderful Yixing teapot is a rich milk chocolate color with chinese characters on one side and a dragon on the other. 8.5"w x 4.5"h x 5.25"d. Holds 14 oz. Includes removable infuser. 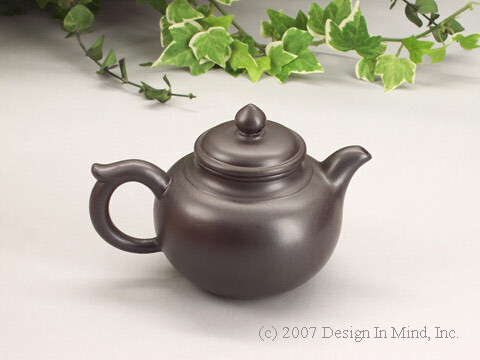 This wonderful petite Yixing teapot is deep brown and has an internal strainer. 5.25"w x 3.5"h x 3.5"d. Holds 7 oz. 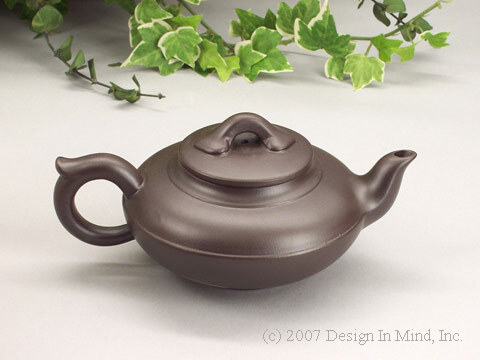 This personal size Yixing teapot is deep brown and includes an internal strainer. 7"w x 3"h x 4.5"d. Holds 10 oz.